I love creating wish lists and gift guides since gift giving is one of my most favorite things in life and I love finding just the right gifts for the people I love. 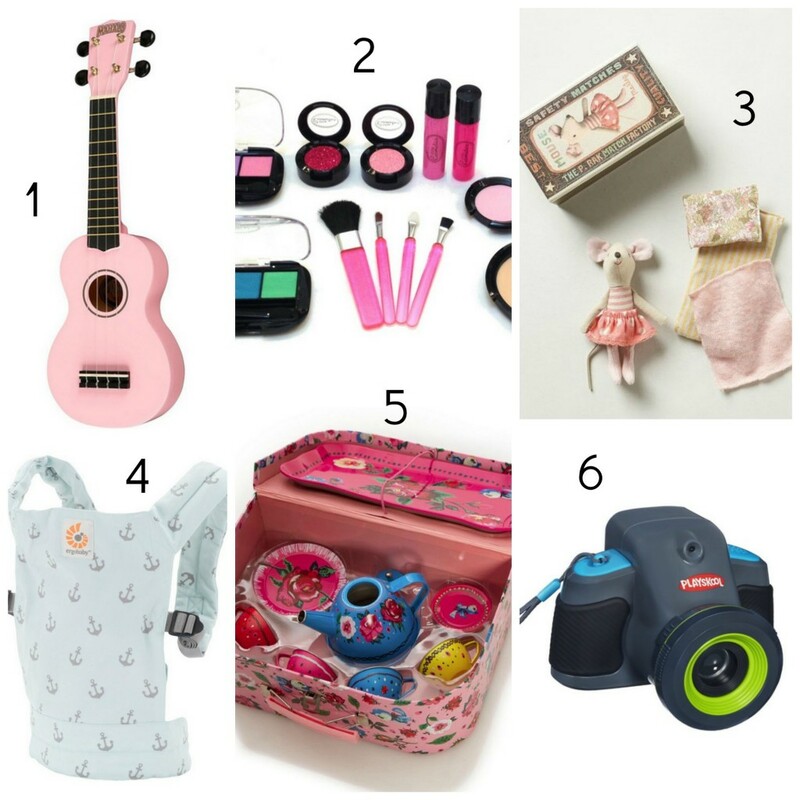 As such I kept meaning to do a gift guide/wish list before Fern’s 3rd birthday, but time got away from me and I never got around to it before the day arrived. BUT, since I already had this half-finished list of lovelies sitting in my drafts folder, I figured it would be fun to share still in case you’re in need of some gifting ideas for the little lady in your life. Quite a few of these are items we own and love and a few are still on the wish list. All of them are things I know my girl would adore. 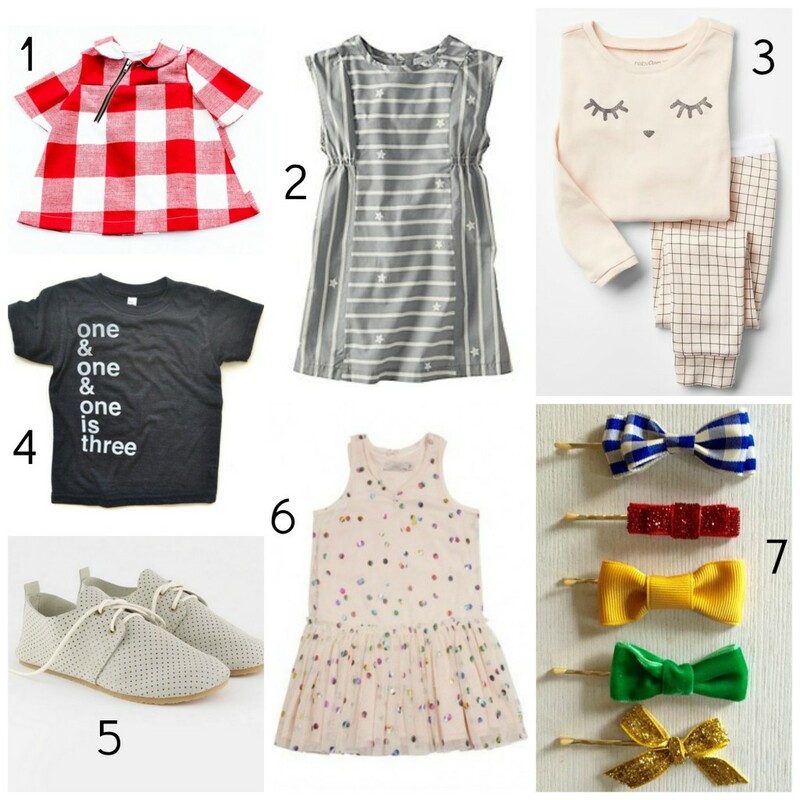 I’ve categorized them by gift type: Do (engaging activities…think puzzles, games, etc…), Play (toys and the like), Read (you know…like books), and Wear (clothes/shoes/accessories). Kids love stickers and these ones are super awesome. I only shared a couple of the themed stickers, but there are a ton of cool options: sweets, mermaids, monsters…I could keep going. Fern’s favorites are the ballerinas and our set is almost totally used up! The ones on a roll are super fun too (and these Yellow Submarine ones would totally be a hit since Fern is completely obsessed with the song at the moment!). These are such a perfect travel activity or great for stashing in a backpack for on-the-go. Fern loves these and they’re a great alternative to handing her my phone when I need her to engage in a quiet activity. We like to bring these when we go out to dinner so she has something to occupy her while we wait for food to arrive. And if ballerinas aren’t your girl’s speed, there are a ton of other fun magnetic options too. Kids can configure the walls of this sweet, little cardboard house to create their own easily portable spaces. Encourages creativity and imagination, which is key for a great kid’s gift in my opinion. These are hands down my absolute, most favorite kids toy of all time. These were a fan favorite in my classroom back when I was a preschool teacher and I always wanted them for my own kids one day. Fern’s Oma and Opa got her these for her birthday and they’ve been a big hit. Fern isn’t typically into many activities outside of the dress-up and playing with dolls box, but these have caught her attention. She likes to build bed for her dolls and houses and castles and they’re super easy to use (way easier than Legos – praise the Lord!) so she can actually make things on her own. I’ll admit that they’re pricey, but they are 100% worth the cost – and totally spring for the larger set, because you’ll need it. 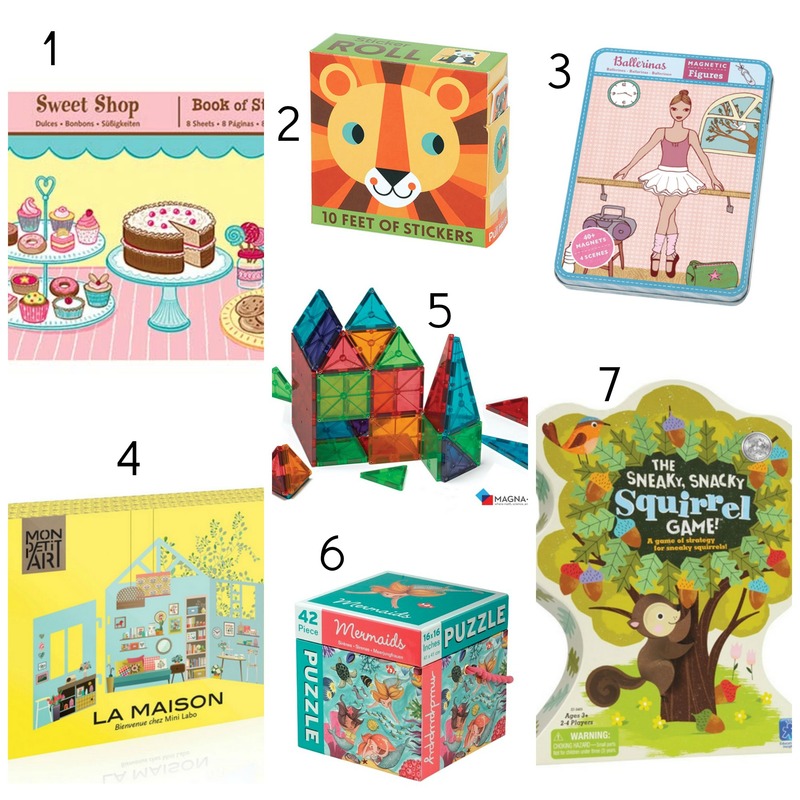 Puzzles are always a great gift and Mudpuppy makes some really great ones. This mermaid cube puzzle is perfect for my 3-year-old’s current skill level…doable, but still a challenge. One of Fern’s friends got this game for her as a birthday gift and it’s been so much fun playing together. It’s super simple, which makes it a great first game for little girls! How sweet would it be to see my little one playing a tiny ukelele? Ummm…pretty freaking sweet. And maybe the pretty, pink color would convince her to sit still for long enough to learn how to strum. Fern is forever wanting me to put makeup on her and for a long while I could hand her random brushes and let her pretend to put on makeup, but now she wants the real thing and will tell me, “Mom, there’s no makeup on this brush!” Ooops. Well, I’m still not ready to let her use the real stuff, but I think these fakies from Little Cosmetics would definitely keep her happy since they look so authentic! My mom got Fern a few of these for her birthday and I’m pretty sure I’m just as smitten with them as she is. Maileg makes a ton of other cute toys as well, but these mice have won my heart. We love the little matchbox mice! This is an especially great gift if your little one has a younger sibling who is often hanging out in a carrier. Kids love imitating real life and I can just imagine the sweetness of my daughter carrying her baby dolls around in this. When it comes to tea sets, plastic isn’t the prettiest and ceramic is still too delicate for my little bull-in-china factory, but a tin set is just right. Bonus points for the cute suitcase that stores the set when it’s not in use! The perfect gift for the aspiring shutterbug in your life. Plus, this gift means they’ll no longer be asking for mom or dad’s phone to snap pics – they’ll have their own (much hardier) camera. Because sometimes little girls need this reminder. There are other fantastic colors in the color wheel too! This book is a classic, but somehow we didn’t have it in our collection. Thankfully the situation has now been rectified. It’s all about how princesses are so much more than fancy dresses and they don’t need to wait around to be rescued for a prince. So, so great! 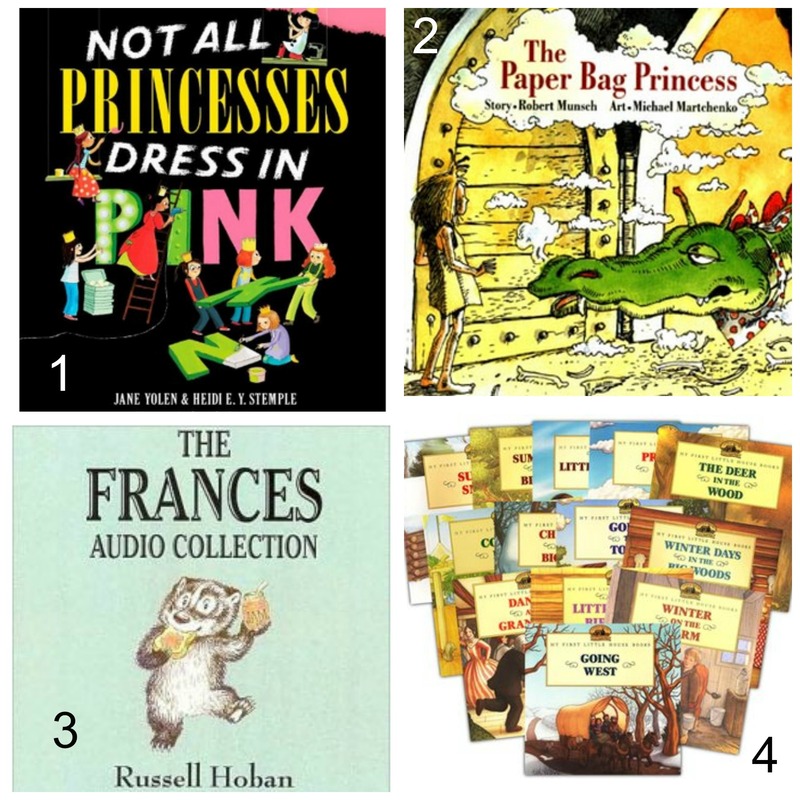 The Frances books are a great gift on their own, but audio books are a great quiet activity and little ones will love listening to Glynnis Johns narration and hearing the classic little Frances tunes come to life. Great for car trips too! We have one of these books, though I’m not sure where we got it, and Fern adores it. I loved the chapter book series when I was a kid, but Fern is still too little to introduce those, which is why these are perfect. Then one day I got to thinking…I bet there are more of these. So I looked online and lo and behold, there is an entire set. They’re a little tricky to track down, but I found them! 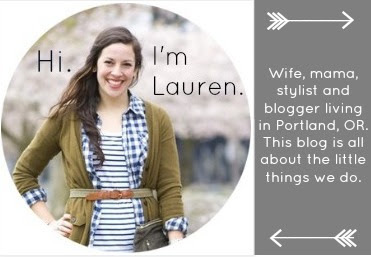 This little plaid number is so freaking cute I can hardly stand it. Unfortunately it was sold out last I checked, but maybe it’ll come back in stock! Hanna Andersson has really impressed me lately with their girl’s clothing. Some great options in more neutral colors and patterns that aren’t quite as busy as the usual Hanna stuff. And the quality of their clothes is seriously unmatched. You’ll be handing them down for years. This dress is one of my favorites from their current collection. Gap PJs are always my favorite. Cool prints and great quality. These sleep face jammies are too cute! Mama Case t-shirts are the only ones I can seem to get my daughter to wear these days (because, “They’re so cozy Mama!”). They’re super soft and the designs are so fun. This “one & one & one is three” shirt was worn for Fern’s birthday. Perfect, no? They also have it in other colors, along with a slew of other cute tees. Zuzii shoes have been on my wish list for Fern for ages. Such cute shoes – perfect for dressing up or downs. They have so many sweet options, but these oxfords are one of my faves. This is a party in a dress. This would be such a fun dress for a birthday girl! My girl is obsessed with all musicals and The Wizard of Oz is a favorite of hers. We have the clips and she gets such a kick out of them (she calls them her “Dorothy hair clips”). I love how the inspiration shines through when they’re grouped together, but they’re also pretty individually and great for dressing up an outfit. What would you add to this list? Are there any toys/books/clothes/activities that your littles love that I simply must know about for Fern? Let me know in the comments and happy gifting! This is a great round-up of ideas! I have two nieces in this age range, and will bookmark this post for their next birthday.